Image of Maximin's Secret confided to him by Our Lady of La Salette (recently obtained from Vatican Secret Archives). To view a LARGER SIZE click here. 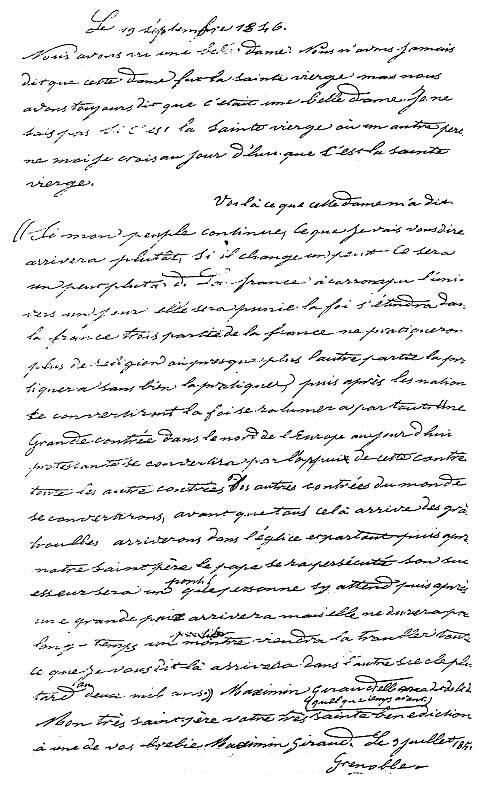 The original writing [letter] of the Secret of La Salette by the seer Maximin Giraud, sent to Pope Pius IX in Rome in 1851, was rather recently obtained from the Vatican's Secret Archives. 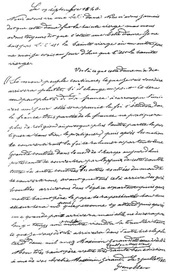 Click here to view an image of the original envelope which held the letter [*Secret confided to him from Our Lady of La Salette] which Maximin put into writing in obedience to and in front of, his bishop, at his bishop's palace. *"At this point, (Our Lady) for a moment did not make herself heard. I could see, however, that she was continuing, as if speaking, to move graciously her kindly lips. At this moment, Maximin was receiving his secret." -Melanie Calvat, from the Imprimatured text, "Apparition of the Blessed Virgin on the Mountain of La Salette the 19th of September, 1846". "Before all that arrives, great disorders will arrive, in the Church, and everywhere. Then, after [that], our Holy Father the Pope (Gregory XVII) will be persecuted. Maximin wrote his Secret at the bishop's palace, in front of Bishop de Bruillard's people, perfectly unconcerned, on July 3 in the evening. He was asked to rewrite it again because of spots of ink. The soiled autograph was burnt. Lastly, Mr. Dausse handed the Secret to Bishop de Bruillard, to be sure of its importance before affixing his own seal to it, and to send it to the pope. The sealed envelope was countersigned by two witnesses, at 7:00 p.m.
What follows is a literal translation from the French with the *spelling, the punctuation and a lay-out, which make it more readable. *There were punctuation and spelling mistakes by the young shepherd in the sealed secret sent to Pope Pius IX, for who writing in French was an exploit. Like all the prophecies, this one is a call to vigilance. It warns for the future, without satisfying curiosity. The seers interpret as they can the picturesque terms that they know not. They extrapolate, confuse the logical and temporal plans (like St Paul the Apostle in the epistle to the Thessalonians). On September 19, 1846, we saw a beautiful Lady. We never said that this lady was the Blessed Virgin but we always said that it was a beautiful Lady. "If my people continue, what I will say to you will arrive earlier, if it changes a little, it will be a little later. France has corrupted the universe, one day it will be punished. The faith will die out in France: three quarters of France will not practice religion anymore, or almost no more, the other part will practice it without really practicing it. Then, after [that], nations will convert, the faith will be rekindled everywhere. A great country, now Protestant, in the north of Europe, will be converted; by the support of this country all the other nations of the world will be converted. My Most Holy Father, your holy blessing to one of your sheep. "Revelations of Pius IX to Marie-Julie Jahenny: 'The Secret' of 1958"
Vorrei sapere se in Italia esiste un gruppo di fedeli o qualche sacerdote che segue come vero Papa Gregorio XVIII per mettermi in contatto. Grazie. Our Lady said "now Protestant" which means, the country has been Catholic. Sweden is Catholic from 11th century became Protestant in 1527. John I see your point, yet, it could still be a country that was never officially Catholic. Perhaps it could be one of the Scandinavian countries - Norway, Sweden, Finland, Denmark? I would like to find out how I can get a true blessed wax candle from TCW for the incoming three days darkness. Hi. Please go to (http://www.tcwblog.com/182861420) to obtain a 100% beeswax candle (blessed by Fr. Tran) for the upcoming 3 Days of Darkness Chastisement. I thank you TCW staffs and Father Tran for bringing the info for the true Pope in Exile. I pray for the restoration of the true papacy.